SNMP stands for Simple Network Management Protocol. 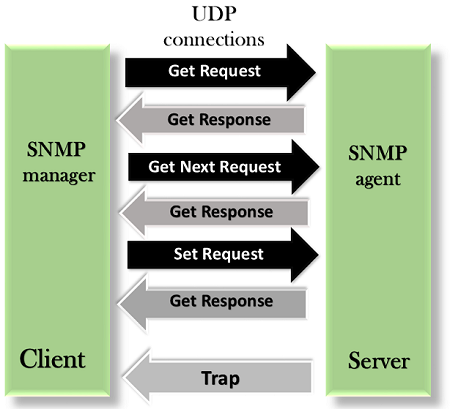 SNMP is a framework used for managing devices on the internet. It provides a set of operations for monitoring and managing the internet. SNMP has two components Manager and agent. The manager is a host that controls and monitors a set of agents such as routers. 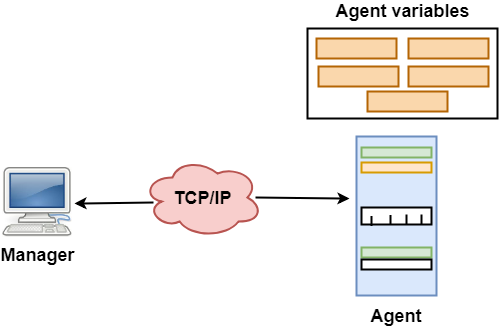 It is an application layer protocol in which a few manager stations can handle a set of agents. The protocol designed at the application level can monitor the devices made by different manufacturers and installed on different physical networks. It is used in a heterogeneous network made of different LANs and WANs connected by routers or gateways. A manager is a host that runs the SNMP client program while the agent is a router that runs the SNMP server program. Management of the internet is achieved through simple interaction between a manager and agent. The agent is used to keep the information in a database while the manager is used to access the values in the database. For example, a router can store the appropriate variables such as a number of packets received and forwarded while the manager can compare these variables to determine whether the router is congested or not. Agents can also contribute to the management process. A server program on the agent checks the environment, if something goes wrong, the agent sends a warning message to the manager. A manager checks the agent by requesting the information that reflects the behavior of the agent. A manager also forces the agent to perform a certain function by resetting values in the agent database. An agent also contributes to the management process by warning the manager regarding an unusual condition. Management is not achieved only through the SNMP protocol but also the use of other protocols that can cooperate with the SNMP protocol. Management is achieved through the use of the other two protocols: SMI (Structure of management information) and MIB(management information base). Management is a combination of SMI, MIB, and SNMP. All these three protocols such as abstract syntax notation 1 (ASN.1) and basic encoding rules (BER). The SMI (Structure of management information) is a component used in network management. Its main function is to define the type of data that can be stored in an object and to show how to encode the data for the transmission over a network. The MIB (Management information base) is a second component for the network management. Each agent has its own MIB, which is a collection of all the objects that the manager can manage. MIB is categorized into eight groups: system, interface, address translation, ip, icmp, tcp, udp, and egp. These groups are under the mib object. SNMP defines five types of messages: GetRequest, GetNextRequest, SetRequest, GetResponse, and Trap. GetRequest: The GetRequest message is sent from a manager (client) to the agent (server) to retrieve the value of a variable. GetNextRequest: The GetNextRequest message is sent from the manager to agent to retrieve the value of a variable. This type of message is used to retrieve the values of the entries in a table. If the manager does not know the indexes of the entries, then it will not be able to retrieve the values. In such situations, GetNextRequest message is used to define an object. GetResponse: The GetResponse message is sent from an agent to the manager in response to the GetRequest and GetNextRequest message. This message contains the value of a variable requested by the manager. SetRequest: The SetRequest message is sent from a manager to the agent to set a value in a variable. Trap: The Trap message is sent from an agent to the manager to report an event. For example, if the agent is rebooted, then it informs the manager as well as sends the time of rebooting.